Brighten up any room with our adorable Thin Leaning Tree with Birds and Nest wall decal! Our wall decals are ideal for offices, living rooms, entryways, classrooms, even your car or glass shower doors! As shown, the Tree (without leaves) measures 32 inches wide by 54 inches tall. Birds measure approximately 2.5 inches wide by 2 inches tall. 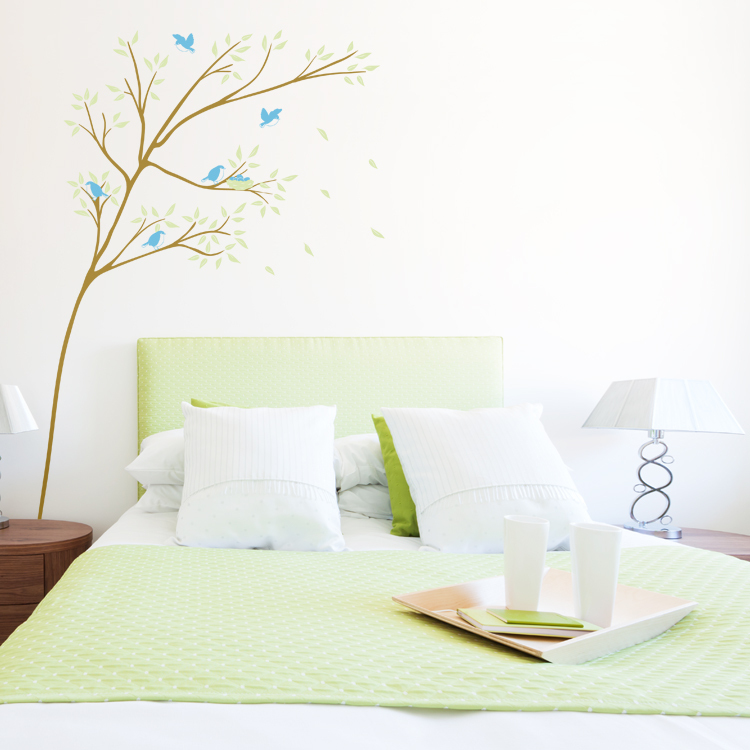 This Thin Leaning Tree with Birds and Nest wall decal comes in sections for easier application. Leaves and Birds comes separately so you can place them however you choose! Tree will come in one color, Leaves and Nest in another color, and Birds and Eggs in another. I just finished putting up the retro spiral flowers in green and blue, and I must say, it looks excellent. I had anticipated that the decal would be far smaller than it was and boy was I surprised when it was so huge that it made the whole room! I really, really love your products. For the amount that you receive and the quality of the product, the prices are excellent! I will probably buy many more of your decals in the future and for sure will recommend your company to all my friends. I think that you should start posting your decals on Etsy, and maybe make a facebook fan group!